Anglian Water has announced the final set of framework partners to deliver around £200M of work across its East Anglia and the East Midlands region during the AMP6 period (2015-2020). 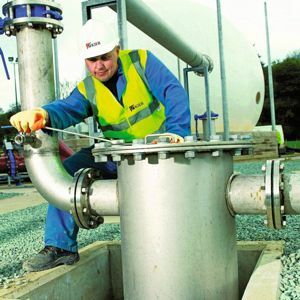 A total of five companies are expected to form Anglian Water’s Integrated Maintenance and Repair (IMR) alliance, which is divided into two specialist areas, covering water and water recycling projects. Clancy Docwra and Kier MG have signed contracts to carry out the firm’s water infrastructure maintenance work. This will involve carrying out around 40,000 water jobs a year including repairing burst mains, finding and fixing leaks and replacing lead pipes. The contract is expected to be worth around £140M over five years. This follows announcement of four preferred bidders for water recycling maintenance work earlier last week. Works are expected to be worth more than £60M and will include fixing collapsed sewers and replacing damaged manholes. The four bidders – Clancy Docwra, Claret Civil Engineering, Danaher & Walsh and Public Sewer Services – will spend the next three months working on a joint business plan before signing contracts to form the final part of Anglian Water’s IMR alliance, completing around 7500 water recycling jobs every year. Anglian Water head of capital delivery and supply chain management Jason Tucker said: “Confirming our partners and preferred bidders for the final two alliances brings our tier one AMP6 procurement process near to its conclusion. Contracts may run until 2030, with a review after each five year AMP period. Feel free to browse all jobs in water and wastewater here.